I make no bones about my love for Felix. If in doubt, read this post! Last week, Jerry Beck over at Cartoon Brew lamented the disappearance of old cartoons from the public airwaves. He’s right too, the broadcast of all the old favourites isn’t near as frequent as they used to be in the past. The reason is absurdly simple; back in the day there was a need for programming, but that was quite expensive. Old cartoons were all too cheap and plentiful to cobble together into a half hour show and throw on whenever the need arose. Unfortunately the advent of cable and satellite heralded a boom in programming production so much so, that there is now far more programming than there is time to show it all. The result is that all the really old stuff is pushed out in favour of stuff that isn’t so old. Hence all the old Hanna-Barbera shows getting shunted on Boomerang in favour of the first wave of Cartoon Network originals. Nickelodeon has more than enough stuff in their back catalogue thanks to the channel’s 30 year history. Disney half-heartedly airs older shorts but in a pseudo ironic “here’s a real oldie” kind of way. So all that sounds a bit depressing. However, the advent of the internet has opened a whole new plethora of opportunities for old animation. Here’s just a few ways that fantastic old cartoons can be brought back into the public consciousness. This should be the first and most obvious choice. A quick search fails to reveal a dedicated channel. Oh sure the videos are already uploaded and playlists exist, but from what I could see, there was nobody making a concerted effort to promote old cartoons through a dedicated channel, replete with a community of fans rallying around it. Such a concept did exist in a previous time with sadly defunct ReFrederator site, but that does not preclude somebody from starting another one. With over 40 years of cartoons that barely take you into the 60s, there should be more than enough content to “release” and promote older content for many years to come. This is by far the most promising solution. Like everything in life, continual conversation keeps memories alive. It’s how all the legends and fairytales were passed down from generation to generation. Entertainment is no different and older stuff only disappears only because people either a) stop talking about them or b) they’re left to rot in a storage warehouse somewhere. Surprisingly enough, Lawrence Welk is still in the public consciousness thanks to reruns of his shows on PBS. Keeping the conversation about old cartoons going is necessary to keep them alive too. Thankfully in the modern era, the internet and blogs in particular are a superb way of attaining this. Site like Steven Hartley’s Likely Looney Mostly Merrie are a great way to engage anyone and everyone who are interested in seeking out the classics. Some of the more well known classics out there continue to command a considerable marketing presence (the Looney Tunes, anything Disney and obviously Tom and Jerry come to mind) others have fallen by the wayside thanks to a number of factors. Loss of copyright, ownership by individuals not well versed in the characters they own and general obscurity continue to blight a number of classic properties. Notice something? Betty pulls in almost 10 times the amount of products that poor Felix does. What does that tell you about how merchandise for the latter is being handled. Lack of familiarity isn’t a factor either. Felix is still a character that almost anyone could instantly recognise. 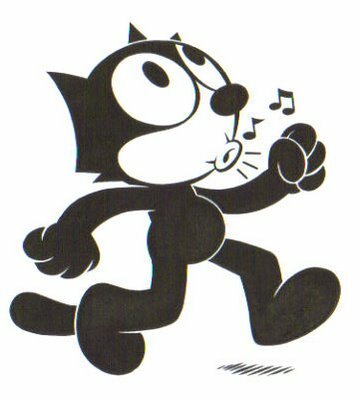 As you can see, Felix is also synonymous with that famous clock so there is a strong correlation between a character and the merchandise they appear on. Admittedly a last resort attempt here but it is possible. Back in the day, new shorts were pushed out on a weekly or bi-weekly basis. As a result, they were designed to knocked out quickly and cheaply; limits that are synonymous with how content destined for the internet is published today. New versions of classic cartoons could easily follow along similar lines and if anything, could reverse the startling trend gripping some sectors that involves carbon copying Family Guy’s excessively stiff animation and adult-oriented plots. The opportunity to loosen things up a bit would not be lost on John K. and has been embraced wholeheartedly by Aaron Long and his series of Fester Fish shorts (although as a one man band, his output is considerably slower than a weekly schedule). So there you go, what do you think? In what other ways could the internet help old cartoons? Share your ideas in the comments.